— Analysis by planner’s consultant is coloured by a car mindset. COMMENT & ANALYSIS: Last week it was claimed that the decision to reject the planned College Green Plaza was reasonable or justified — that’s not surprising from car park owners and others like them, but it was surprising coming from people who support sustainable transport and the goal of more liveable cities. Some of them even said that they read the An Bord Pleanála planning inspector’s report, but a possible issue is that they didn’t read or pay enough attention to the Traffic and Transportation Assessment. The inspector’s report with the backing of the consultant’s traffic report contains a huge amount of outdated thinking about how humans move in cities — for example the reports puts a heavy weighting on motorised traffic but little care about cycling. The motoring worries are in stark constraint how the planners dismissed cycling — including dismissing even the National Transport Authority when they said segregation was needed on Dame Street, and overriding the Dublin City Development requirement for contra-flow and provision to be made for the Greater Dublin Area Cycle Network (more on cycling details in another article). The inspector’s report sounds authoritative about this issues but the detail given in the Traffic and Transportation Assessment is often shaky at best. Here we basically have an example an attack on the base line of the model times as if the model times isn’t based on an average. A model can’t do that and the model time outlined above is within the time range given by (the usually very accurate) Google Maps. There’s a major issue trying to debunk a model by using single trips taken by the author — all sorts of factors can impact on single trips and you can’t get an average from one single trip. The author seems to think walking, cycling and public transport isn’t for visiting friends or relatives, and somehow healthcare workers also don’t use sustainable transport (the Mater hospital Smarter Travel programme starkly shows that’s not the case). And another problem is factoring in delivery vehicles at the time previously given at 17:52 — ie the middle of the evening rush hour where deliverers are not a priority, clearways are in effect etc. A side note here and it might only be a side note at this stage: The city is encouraging the development of last-mile delivery using cargo bicycles. Cargo bicycles are already in use by a number of local and international businesses — a growing trend not just in Dublin but around Europe. Where there are more traffic restrictions companies adapt. As we have previously reported, the data for Dublin shows that the number of car users, which includes an estimate of drivers and passengers combined, crossing into the canals has decreased 15,156 people in 10 years and down 27,812 since 1997. At the same time the number of commuters overall across all modes combined has increased from 180,000 in 1997 to nearly 211,500 commuters. For a former planner inspector hired as a consultant to suggest the city try to reverse this trend of not providing for new car traffic by some new major road building is not just strange but worrying as it goes against both national and local policy and the trends for more sustainable and liveable cities. The problem here is that the author does not just rant about the well-established effect of car traffic evaporation he also got induced demand wrong. Induced demand in general terms is that as supply increases, more of a good is consumed — in road terms it basically means “that increasing roadway capacity encourages more people to drive, thus failing to improve congestion”. Citylab.com and Wired.com both explain it quite well in detail — it’s shown in academic studies and proven to happen over and over around the world. The problem with comparisons with other cities is that it is necessary to examine all aspects of the facilities being compared. In this respect I would consider the best example to take would be that of Oslo City Hall Square. This large square was pedestrianised in the 1990’s but that was not done until after the completion of the Festning Tunnel in 1990. Wikipedia states this tunnel runs under the City Hall Square and is 1.8 kms long with a total of 6 lanes. Such tunnel building is often cited when relocating of street space is discussed, but it is rare for sustainable cities to be still planning such tunnels today — the thinking has generally moved on. Utrecht are now reducing road capacity for cars and providing no alternatives besides already congested ring road motorway. Amsterdam provided a car tunnel under an expanded section of its central train station but more recently it has chosen to cut off other east-west traffic routes in the city centre with no alternative driving options (for the record, the city’s new metro line serves a different direction, north-south). The traffic reports notes large roads besides Copenhagen’s town hall square which was used as an example. Dublin City Council and the NTA would do well to stop referencing Copenhagen so much — Dublin’s road network or more so the problems with space and the issues of relocating space are more comparable to that to cities like Amsterdam or Utrecht. Museumplein in Amsterdam or similar spaces in the Netherlands would have been better examples. Paris is doing similar reallocation of space and there is no signs that it is adding to its underground public transport at any kind of similar capacity and even Paris suffers from people saying public transport isn’t good enough in my area yet. Paris is doing that to some of its bigger roads. Meanwhile, Utrecht has fewer big roads and it is cutting space for cars on them — more space for greenery, walking, cycling and generally people. Like Dublin these cities have achieved and are expecting more modal change from cars to walking, cycling and public transport. The same thing will happen as has happened when the city had the introduction of Grafton Street pedestrianisation, bus lanes, Luas, the College Green Bus Gate, etc etc — that is to say, there was car traffic evaporation. Worryingly the author says that “there would be concern that there could be negative impacts on Capel Street, from where much of the displaced traffic would appear to emanate” — this shows a lack of understanding that little traffic actually emanates from Capel Street, the street is not a main road, thus it is effectually a city centre rat run with very little of the traffic using the street having any business on the street. There was also concern expressed that footpaths on the quays could not accommodate the extra bus stops — there’s two presumptions that seem to be at play: (1) that the quays would be the only bus stops people who currently use College Green / Dame Street would switch to as to get to College Green — this is deeply flawed as many bus users coming from different directions would likely disembark before coming to the quays (ie at Dame Street beside City Hall, at George’s Street, etc), and (2) that footpaths cannot be widened when the realty is footpaths can be widened and decluttered (and still provide for buses and the Liffey Cycle Route). It was within the planners powers to make wider footpaths a condition of the project. The An Bord Pleanála inspector’s recommendation and board’s direction — as we reported here — is all coloured by the transport analysts which is old-school thinking which dismisses basics in sustainable and active transport planning. The possible traffic impacts of the proposed development was the first point given by the inspector and the board for the rejection, this was dressed up as a traffic modelling issue when no model can given the details and certainly the planners were looking for. The flawed thinking about the impact on buses only came second and the impact on pedestrians on the quays came third, when it was solvable and should have been balanced with the overall massive positives for pedestrians. Dublin City Council could have been clearer on a number of issues but the main reason that College Green was not approved was flawed thinking from planners and board of An Bord Pleanála — thinking which would put a stop not to just the plaza but any changes like it which might have knock on impacts. Combined, the planners and board failed on their lack of understanding of how sustainable cities look to move people not car traffic, how traffic works, how models work and how change has happened. They have also failed to have vision. If the city or any city followed An Bord Pleanála’s thinking there would be never any progress on plazas, bus lanes, tram lines or cycle routes. Cities would be paralysed and forced to stick to the status-quo. The fact that an anecdote from the planner about their own journey was used in the report is beyond belief. It is amateur, unscientific and unprofessional. Perhaps this particular plan has problems but “it will impact my ability to drive where I like when I like” should never be one. “However, when one looks at journey planner apps one finds regularly that journeys which look like they should go through the city are routed via the M50.” The fact that the author states this is a big problem. it shows a fundamental failure to understand what the city centre needs to be. No private car journey should be routed through the city centre. It is already unsuitable for that and efforts to make it more so are not only futile but miss the point that the city centre should be a destination not a short cut. It’s ironic that so many city centre retailers seem to buy in to making the city an effective route to the out of town shopping centres. The canard about this being impossible until public transport is ‘good enough’ unsurprisingly rears it’s head again. This is a staple trotted out by the likes of the AA every time they want to explain how they aren’t against cycling and public transport _in_principle_ but… The fact is that public transport and sustainable transport is hampered by private cars and efforts to improve it are actively opposed by the very people who are simultaneously claiming they can’t support resource reallocation until public transport is better. Follow the logic and you’ll find they have sugar coated a clear statement that they will never really support public or sustainable transport. What does ‘good enough’ even mean? Millions of trips every year are made on public tranport. Cycling is the best way for me to get in to town, but the Luas is next. Some people will openly admit that until they get a private carriage, that will leave on their timetable and drop them from door to door they won’t give up their cars. I’m sure a lot more have the same attitude but won’t admit it. I don’t thnk we can pander to these people any more. Its a little unclear who the quoted pieces are from. Is it the abp inspector? A report sent to abp from the corpo? the board’s report? @Colm — the quotes are from An Bord Pleanála‘s own Traffic and Transportation Assessment report — it is a supporting document of the planning inspector’s report. Where to from here? So much of transport ‘planning’ in Ireland is focused around widening roads and the through-put of cars. It all becomes a vicious cycle of car dependency and then, obviously, nothing else can work. 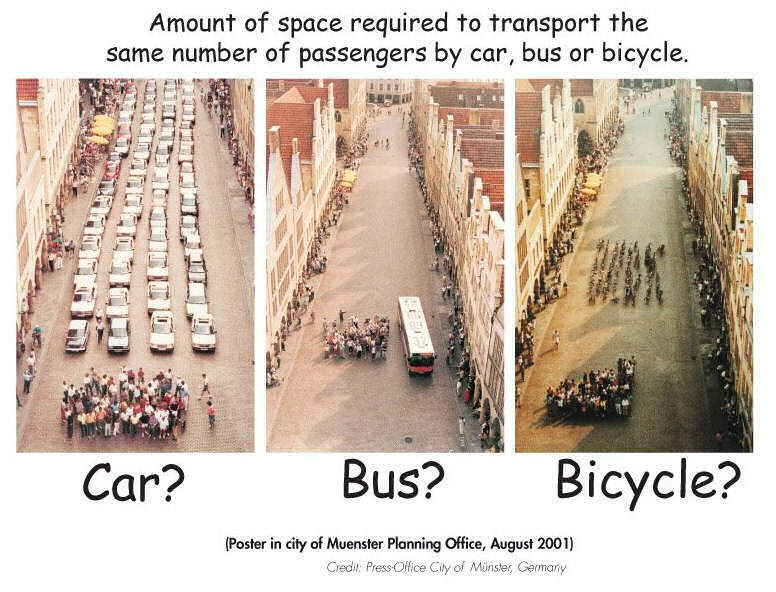 The same thinking seems to have afflicted planners in Galway wrt the ring-road vs sustainable transport. As Cosain has reported multiple times on Twitter, Galway City Council seem to think that there’s no way that they can invest in sustainable transport until and only if the private motor car is first catered to.